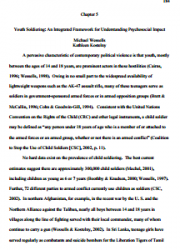 This book chapter aims to contribute to a more holistic understanding of the consequences of youth soldiering, recognizing the diversity within the category “child soldiers” and using young people’s testimonies to show how youth understand their experiences and choices. 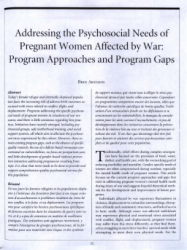 This book chapter reviews six different approaches to the provision of psychosocial support to war-affected children through schools and discusses their comparative advantages in terms of feasibility, scalability and results. 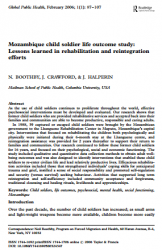 This paper reviews existing concepts, methods and tools for assessing children’s psychosocial wellbeing and evaluating subsequent interventions. 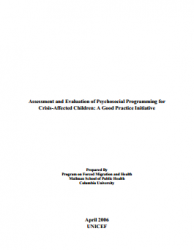 It highlights examples of best practice and makes recommendations regarding some basic principles and minimum standards for working with children. 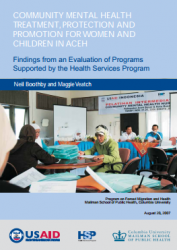 This evaluation is of a USAID-funded community mental health program for women and children in Aceh, Indonesia following the 2004 tsunami. 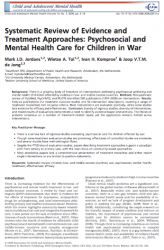 This systematic review of PubMed, PsychINFO, and PILOTS identified 500 publications (1991–2008) on interventions addressing the psychosocial wellbeing and mental health of children affected by violence in low- and middle-income countries. 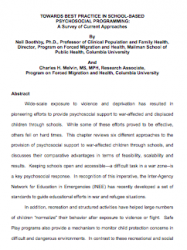 A Psychosocial Structured Activities (PSSA) program was implemented in 21 schools in Northern Uganda identified as amongst those most severely affected by conflict-induced displacement across Gulu and Amuru Districts. 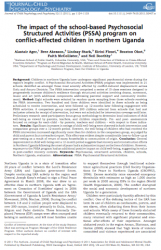 The well-being of children who had received the PSSA intervention increased significantly more than for children in the comparison group, as judged by child and parent (but not teacher) report.